Richard Linklater’s 12-years-in-the-making magnum opus Boyhood has a lot in common with Terrence Malick’s The Tree of Life, another recent, astonishingly ambitious, American coming-of-age drama. Both films track the development of their male protagonist from early childhood to late adolescence using elliptical structures driven by thematic logic rather than plot mechanics. Both take a familiar subject as their focus - the gradual breaking out of youthful narcissism - but their aesthetic and narrative idiosyncrasies make their treatment of it feel bold and unfamiliar. While The Tree of Life tries to capture the experience of childhood as it’s remembered (constructing its action as a free-associative Joycean tumble of emotionally significant moments), Boyhood tries to capture the experience of childhood as it’s lived (constructing its action as a gentle stream of seemingly mundane quotidian moments whose importance becomes clear only in retrospect). 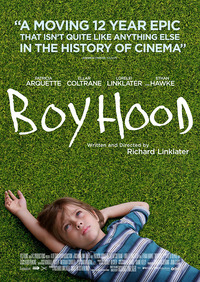 Boyhood revolves around the pretty ordinary life of Mason Jr between the ages of 6 and 18, as he fights with his sister, develops a passion for photography, rebels against some less-than-ideal stepfathers, embarks on his first romantic relationship, and generally constructs an individual identity for himself. Extensive use of temporal markers (artistic, social and political) doesn’t simply come across as nostalgia-baiting cutesiness, but demonstrates just how large a role is played by social context in each individual’s personal development. Mason grows from having interests, opinions and aspirations forced upon him to moulding an individual identity of his own; a gradual, messy process of either rejecting or incorporating (sometimes consciously, sometimes not) the traits of those around him. And this path towards self-actualization can largely be charted by his changing interests in music, books, and films: at first, the cultural backbone of his life is provided by generic ultra-hits; he then gravitates towards brash, just-of-the-mainstream stuff; begins dipping his toe into heady pop-cult classics (wittily signalled by the sight of Mason prominently displaying a copy of Breakfast of Champions as he walks home from school); before finally becoming a self-styled counter-cultural philosopher keen on shoe-horning Baudrillard-isms into conversations (in other words, the kind of person who could walk directly into Slacker). Throughout, he remains a remarkably complex, imperfect character who is neither let off too lightly nor punished too harshly for his flaws. Supporting characters who could have potentially come across as clichés (the single, struggling mother who was thrust into parenthood too young and has heaps of unrealized potential; the hard-arse ex-marine stepfather; the bohemian, commitment-phobic, divorced dad who’s generally considered a loser by other adults but idolized by children), are instead fully realized with rich, nuanced performances that lend every act the impression of having emerged from a realistic inner life. The film is sympathetic to all of its characters, yet doesn’t flinch when it comes to portraying their flaws, and actually seeing them age on screen imbues the material with an extreme emotional weight. This may make Boyhood sound overwrought or dauntingly heavy, but it actually unfolds with a surprising lightness of touch. Linklater’s directorial style is, as usual, observational and self-effacing, which isn’t to say that it’s haphazard. Though compositions don’t call attention to themselves, they deftly reveal a great deal of information about how the characters interact with their environment and physically relate to one another. The meticulously detailed locations look remarkably like real, lived-in environments. Shifts in time aren’t signposted, but subtly ingrained into the action. For the most part, the film eschews melodrama, instead focusing on the small, everyday stretches of time in which little of significance seems to be happening. The cumulative effect is incredibly effective at evoking the sensation of time passing - when you’re caught up in the minutiae of daily life, years can slip by imperceptibly, their passing only registering strongly once a certain milestone has been reached. Appropriately, there’s no real sense that we’re witnessing a beginning or an ending, only points at which the characters’ lives start and cease being documented. This review was published on July 24, 2014.